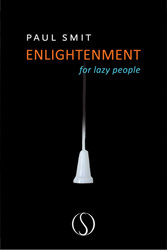 Enlightenment for Lazy People is a bestseller in The Netherlands and has recently been translated into English. What is enlightenment? How can you reach it? Do you have to do anything for it? Will it tire you out? Thankfully, no! You don’t have to do anything. You don’t have to learn a technique, you don’t have to meditate, you don’t have to travel to India, you don’t have to eat like a vegetarian, and you don’t even have to mind your breathing! Enlightenment has everything to do with one simple, but radical, insight.